There's no question that candle light adds ambiance to any gala. The beautiful glow and flickering light will light up any room with its splendor. 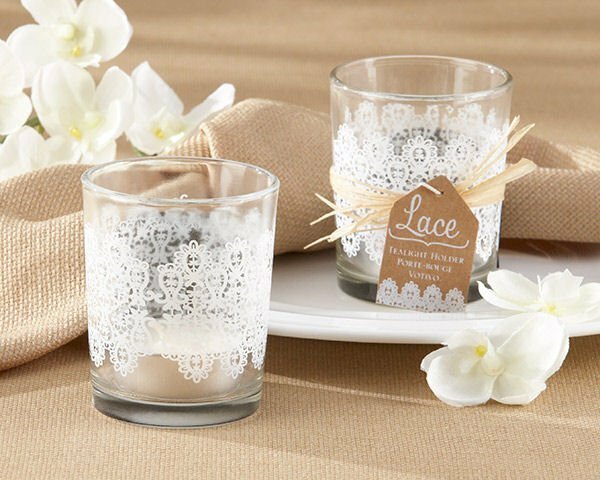 Add our charming glass tea light holder with lace pattern as a beautiful addition to your table setting or an ideal party favor for your guests. Our tea light holder measures 2 3/4" x 2 1/4" in diameter and comes with a raffia bow and coordinated hang tag. Tea lights are sold in sets of four. Fill every table with the warm glow of candle light and the warmth of love on your wedding day.